The dialogue is spoken in Korean, with readily available English subtitles. There is currently no English dub, if that is your preference, but the furry fandom has enough crossover with the anime fandom that I doubt it will be a big issue. However, the animation is much more reminiscent of Western studios than anime, though a few character designs are more Eastern in style. The mix of mostly hand-drawn cel animation with frequent use of CGI effects is similar to late Disney and early DreamWorks traditional animation. The character design and animation are spectacular, excepting a few cases when obvious CGI objects are inserted into the otherwise drawn scenes, which are a bit jarring. 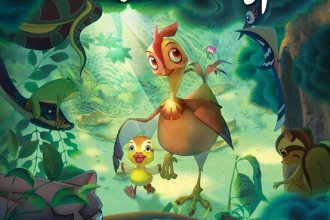 One stand-out moment from the animation side of things occurs when the titular hen must cross through the forest; animals of all sorts pause their normal activities to investigate this strange new creature, in a scene that is full of inventive animation. Leafie is a hen leading an unfulfilling life trapped in a cage in a modern egg farm. She dreams of escaping to the farmyard, and after three days of refusing to eat passes out and is removed as dead from her cage. After the farmyard animals are less than welcoming, she is forced to find a home in the wild. There, she encounters a wild duck who is unable to fly, and therefore vulnerable to the local predator, a weasel with one eye. After a series of unfortunate events, Leafie ends up sitting on the duck’s egg and adopting the duckling when it hatches. She raises the duckling over the course of a year, surviving a variety of misadventures with the help of a (mostly) friendly otter. Though Leafie has themes on man’s treatment of animals, it realizes that these are obvious, and does not hammer the point relentlessly. The movie also has things to say about what it means to be a mother; the titular Leafie has a maternal instinct the size of a maiasaur. The movie makes its points, and it makes them well. On the other hand, Leafie is not particularly funny. It also relies way too much on nasty toilet humor, especially in the middle section when Leafie is forced to return to the farm momentarily. However, in one scene the toilet humor does make a point, with Leafie’s adopted duck son clearly disgusted by the tame ducks and the way they pollute their limited water supply. Perhaps that is the best praise I can give to the movie. I ripped into Happy Feet Two for its toilet humor, but I am giving Leafie a pass for scenes just as bad. It's all about context. The movie is worth watching, flaws aside, both for the neatness of the animation and the touching treatment of its themes. I meant to add this comment sooner, but this article wouldn't have happened without Mister Twister. Well, thank you for reminding. IMHO, one of the best films in the history of ever. Thanks for posting this; a lot of foreign animated movies get pretty sparse coverage in North America, and this was one I was definitely curious about! Toilet humor is very off-putting for me though, so that part of your review has really put me off, but the rest of the review still intrigues me. Ahh, internal conflict! I've been meaning to write up reviews for A Town Called Panic, Le Chat du Rabbin and Den kæmpestore bjørn for some time now. I think what I'll probably do is post short summaries here and save the longer in-depth reviews for Anthrozine. If anyone's interested, the French film Un Monstre à Paris about a giant musical performing flea is coming out on DVD in mid-February, but not with English subtitles, so maybe that's more in my territory.